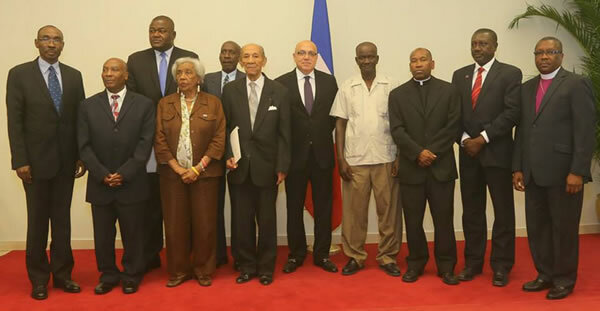 Haiti President Martelly's discussions with political and social factions have proved fruitless to break a deadlock to ease political tensions and persuade six opposition senators to pass an amendment to an electoral law. Because the legislators refuse to fill a quorum of the required 16 needed to hold a session to pass legislation, no elections can be held. By January 12th of next year only 10 senators will be left, effectively shutting down Parliament. It is possible Martelly could rule by Presidential decree, unless he decides to extend the term of Parliament. Despite the threat of a Martelly dictatorship, extremists won't negotiate with him. Their strategy is to build a nation-wide protest movement to force him out of office. In Gonaïves pro-government demonstrators ordered the opposition-six senators to pass the amended electoral law so elections can quickly be held to avoid a constitutional crisis.